24 Remain in U.S. Junior Camp - College Hockey, Inc. Defending champs lead 14 schools represented on U.S. roster. 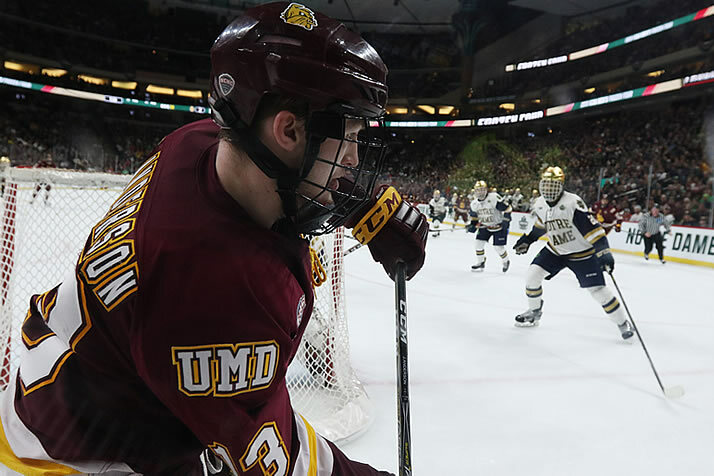 Mikey Anderson recorded 23 points as a freshman for Minnesota Duluth in 2017-18. Twenty-four NCAA players remain on the United States roster for the final three days of the 2018 World Junior Summer Showcase, USA Hockey announced Wednesday. The U.S. opened play at the event with two rosters that combined to win three of four games on Monday and Tuesday. The 24 remaining NCAA players represent 14 schools, led by defending national champion Minnesota Duluth with four representatives. Boston University boasts three players in camp, while Boston College, Harvard, Michigan, Providence and Western Michigan have two each. The World Junior Summer Showcase serves as an audition for the 2019 U.S. National Junior Team and is taking place in Kamloops, B.C. Canada and Finland each feature a trio of NCAA players on their rosters. Canada’s roster features rising sophomores Shane Bowers (Boston University) and Ian Mitchell (Denver), as well as incoming freshman Jacob Bernard-Docker (North Dakota). Finland has a trio of incoming freshmen in Filip Lindberg (Massachusetts), Sampo Ranta (Wisconsin) and Aarne Talvitie (Penn State). Minnesota State head coach Mike Hastings is the head coach of the 2019 U.S. National Junior Team, with assistance from Northeastern assistant coach Jerry Keefe, Dartmouth associate coach David Lassonde, Ohio State associate coach Steve Miller and Minnesota Duluth head coach Scott Sandelin.